When the filling is cooked, set aside and mix up the pie crust. Measure out the flour, cooking oil, water, salt and sugar in a medium mixing bowl and work the mixture together with fork. If the mixture seems a little too moist, add flour by the tablespoon and work it in until the mixture is more crumbly. Use half the mixture to line a 10 inch pie plate. Pat the dough down on the bottom and on the sides. Spoon the pie filling into the pan. 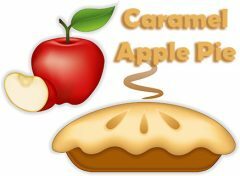 Cut the caramel candies into small pieces and sprinkle over the pie filling. (You don’t have to chop them fine; cutting them into quarters is all that’s necessary). Sprinkle the chopped walnuts on top of the caramel candy pieces. Mix a quarter cup of brown sugar with the remaining pie crust and mix in thoroughly. Sprinkle the crumble crust on top of the pie filling, caramel pieces and walnuts. Bake at 350 degrees for 30 minutes (or until the crumble crust is golden brown). Allow to cool (at least somewhat!) before cutting. Serve with whipped cream or ice cream.